Often, one byproduct of removing a wall or taking down a ceiling is the stray electrical wires. Since most walls will end up having outlets and most ceilings will end up having a ceiling light, this means that dangling wires are a part of home remodeling work in general and wall and ceiling work in particular. Whether the wires terminate in the form of outlets and lights or whether they continue elsewhere, they must be dealt with. Stripping back the wires all the way to the service panel (circuit breaker board) is rarely the best choice. For one thing, the wires in question may be part of a circuit that powers other areas of the home. For another, removing the wall and ceiling drywall would be wasteful and ineffective. What should you do to safely and easily deal with them? There are many wrong ways to cap electrical wires, and homeowners and electricians alike frequently run across wires that are improperly spliced and capped. Junction boxes might be hidden behind the ceiling or wall drywall. Even worse, stray wires might be secured with electrical tape and then hidden behind the wall. The answer is fairly simple. Leave the wires as they are, but pull them backward. Then, cut the wires to size and enclose the ends of the wires in a junction box that is then covered with a solid faceplate. This solution is compliant with most electrical codes. Terminating the electrical wires and capping them in exposed electrical boxes is the safe, efficient, and code-compliant method of dealing with electrical wires that must be cut at mid-point while still remaining live. All wires need to be contained in junction boxes, and the junction boxes need to be at the level of the finish surface so that they can be seen and accessed. Before taking down the wall, you must shut off the circuit breaker. Increase your margin of safety by laying electrical tape across the circuit breaker switch to prevent anyone, even you, from accidentally flipping on the breaker. 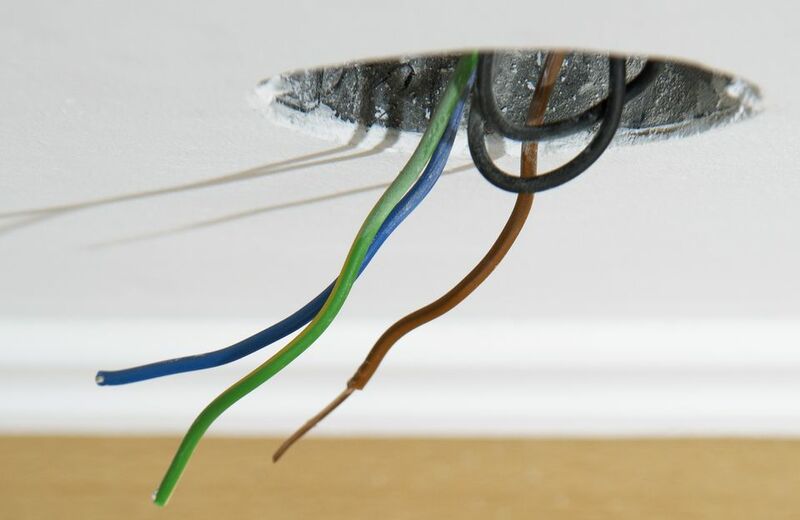 Once you have removed the ceiling or wall, you no longer have anywhere to put the stray wires. You need to find the closest available spot to place the wires. This usually means looking backward in the wire run, since you need to gain wire length. As a rule of thumb, circuit wires usually, but not always, will fan outward from the service panel, so you can typically begin pulling the wires back in that direction. Once you have secured a new location, cut an opening in the drywall with a jab saw, reciprocating saw, or RotoZip saw that matches the size of the electrical box you intend to install. In many installations, there is no way to fasten a conventional junction box of the type that nails onto the side of a stud, because the drywall is already in place. The solution is to use what is called an old-work or remodeling box, which attaches to the drywall with wings that grab the back of the drywall. Pull the electrical wire through the hole. One way to reach into closed spaces and pull back wires is with an electrician's fish tape. This spooled flat metal tape is stiff enough that you can push it back to the start of the electric wire, tape the wire on with electrician's tape, then pull (or fish) the tape and wire back to the new location. There may be several feet of excess wire. Prior to pulling the wire through, cut the wire down to size so that roughly 8 inches of the wire will protrude into the box. Pop open one of the access holes in the back of the box with the flat-head screwdriver. Pull the cable through that access point. The electrical box may not fit on this first go-around. The reason for making this a tight fit is because old-work boxes do not have much tolerance for error: just two narrow tabs at the top and bottom hold the box into place on the front side. If the hole is too small, use the jab saw to shave off excess drywall. If you plan to do a lot of drywall work on your home, it will be worth your while to purchase a drywall shaver. This metal tool, which looks like a cheese grater, is effective at grinding down small sections of drywall. With the manual Phillips screwdriver or cordless drill, screw the old-work box into place. This forces the wings to open and pull forward, cinching the box tight in the opening. If using a drill, set the drill's torque low as it is easy to strip these screw heads or break the wings. The wires cannot be left as they are bundled in the cable sheathing. They must be pulled free and capped with wire nuts. With the cable ripper, pull outward three or four times to create light scores in the cable casing. With the utility knife or scissors, cut off the excess sheathing. It is not necessary to expose the wire ends since they will not be powering any devices. However, if the ends of the wires are mangled, snip them back until you reach a smooth section. Cap the wire ends with wire nuts. Tape each nut onto its respective wire with electrical tape, then tape the wires together. Bare copper wires do not need to be capped. Gently fold the wires accordion-style and push them into the box. Be careful not to detach the wire nuts. Screw the electrical box's faceplate onto the box. It often helps to use a manual screwdriver for this operation since these screws' slots tend to easily strip with a cordless drill.